Feel the Warmth of Summer! At the Summer Solstice, the Sun enters the sign of Cancer and a new quadrant in the sky—as it begins its’ annual descent in the sky. With this waning light, the previous expansive urges of Gemini are countered by the internally-directed forces of Cancer’s cardinal water. In this universal solvent, one’s desires, sensations and thoughts are merged together—to form the discerning judgements of one’s feelings. These emotions enable all individuals to relate to the content that they find in their personal surroundings. At the high noon of the year, it’s time to find a base of comfort, to protect one’s self from the shifting currents. 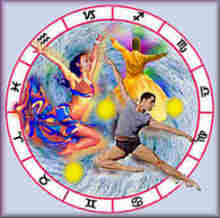 From this base, many individuals will find the confidence to express the creative visions of Leo. With these desires, they will be inspired to provide the services of Virgo—so that they can make our environment a delightful place to play. Hallelujah! The Sun is in Aries and Spring arrives again, as the Sun crosses the equator on its’ journey to the north. This monthly blog is presented when the Sun enters a new sign. (Opps, we missed Pisces). This is to encourage all of our subscribers to follow our interpretation of The Dance of the Seasonal Lights. If you haven’t done it before, this is the time to start, for here at the Spring Equinox, the seeds of the past are born anew, to begin a new journey of discovery. Check out the menu above (on our website).. and discover how Aries fits into Nature’s 12 step process of creation. getting longer every day. This brings hope of a brighter future! So that all individuals can focus on what they wish to be! —so that we can teach them to others! the wisdom they will need, to make this a better world. strives to achieve these goals.